I marvel how some religious communities justify exclusion and hatred as an expression of the divine command to love. Love does not insist on its own way, but policies of exclusion and expressions of hatred are somehow based on insistence. And there is a point at which exclusion may become hatred. While it may be easy to denounce individuals and radicalized organizations who attack worshiping communities, is much harder to denounce communities who use words and policies to damage human beings when they believe they are simply being faithful. Excluding others is not new in Christianity. It arose centuries ago when the church found itself in a privileged position and was recognized as the official expression of faith. One had to conform to an expression of Christianity that was acceptable to the political and religious leaders that supported the face of society with which they were comfortable. Failure to conform risked exclusion in the form of eternal punishment. Debates arose as to what rights a non-Christian, called a pagan or heathen, should have and if their property could be taken away from them. The Church would eventually recognize the legitimate rights of those who did not want to be Christian, however, there remain church communities who hold the right to treat non-Christians, or even those they perceive as not true Christians, as subjects of scorn rather than love. A fundamental right to restrict or bar others or their behaviours that make us uncomfortable seems to be present in many religious and non-religious communities. Within some religious congregations the justification of this exclusion seems to be an adapted version of what is known as the holiness code. It is the written or unwritten code that describes and defines who should be part of the community and who cannot because it delineates acceptable religious behaviour. It is understood as the measuring rod to limit behavior and restrict others from becoming part of the community rather that as an expression of the hope or aspiration of community involvement and activity. The devotion to the prescriptive use of the code becomes a rod to mete out discipline rather than a guiding stick. Advocates of strict observance of the holiness code also call themselves traditionalists. They insist their hatred is really an expression of love. Their words and actions testify to how far from love they have strayed. These traditionalists convince themselves that they, and only they, know what love is. They, and only they, may proclaim and build the boxes that shelter the purity of their beliefs. Those that think and live differently, who may dare to live a different or alternative view, are quickly labelled as heretics, as revisionists or as progressives. To promote unconditional love is seen as a threat to the security of the holiness code and an affront to the sanctity of god’s commandments. They place themselves in god’s judgement seat with the claim that god’s hatred is their model. What god hates most is the sin not the sinner. However, the absurdity of this statement is revealed when one realizes that it is not the action but the individual that is condemned to eternal punishment. Although the Bible expresses an unconditional message of love, many find a message of exclusion. Gentiles were excluded. Jesus came with a sword to divide households (Matthew 10.34-36) and those who were being excluded were Christ followers. Their actions and beliefs were novel, breaking with tradition and a threat to the status quo. Paul and Jesus announced god present in their lives in a non-traditional way, but one that still anchored them in the prophetic tradition. Exclusion is not presented as a spiritual gift or religious value. In the face of these conflictual situations, the dominant message of the Bible was to express love not hatred, inclusion not exclusion. The remedy to hatred and exclusion is not more exclusion and hatred. 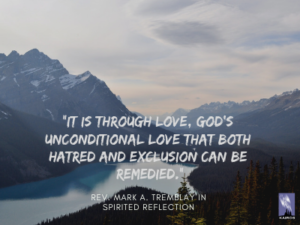 It is through love, god’s unconditional love that both hatred and exclusion can be remedied. God’s love is not selfish or conditional; Paul reminded the well-meaning Corinthians that love does not insist on its own way. Through compassion, the earliest churches learned that people who live, speak, dress and eat differently can have god’s spirit within them. Exclusions must not grow into expressions of hatred nor should exclusions be used to promote conditional love. Unconditional love is truly uncomfortable. The promotion of unconditional love has always been a threat. It got Jesus executed. He was the greatest revisionist of all. Simply stated, love is better than hatred and it is the way of Jesus! Exclusions may be the greatest violation of the holiness code. Conforming to particular beliefs and actions can undermine the promise of transformation. A gross form of idolatry is expressed when we claim that god’s work of transformation is to conform us all to the same mold. Exclusion runs the risk of being expressed as hatred. Love never risks being expressed as hatred, because it does not insist on its own way. Love celebrates the variety and diversity of creation. Rev. Mark A. Tremblay is the minister of Knox Presbyterian Church in Calgary. He emphasizes a relational understanding of faith and spirituality; and is researching how our theology has supported of the Doctrine of Discovery to understand what needs to be repudiated.